Firstly let me say I am not a Koi expert. Articles I have written and books I have written on the subjects surrounding Nishikigoi over the years will confirm this statement. I have never professed to be an expert before, I am not an expert now and I will never be an expert. If some wish to refer to me as one, then it is their error and not mine. However, I do know some true Koi experts and this page should attempt to highlight them. For those who have read my previous texts over the years it will be noted that my genuine attempts to explain to others various points regarding the subject of ‘Koi Appreciation’ have, at best, been fairly rudimentary to say the least. I have always avoided going in deep in these matters and there are good reasons for this. The only true Koi Experts I know of in the world are only to be found in Japan. The ones I speak of are professionals in their daily work and many have been raised with Nishikigoi from birth. Most of these people live within walking distance of the area in Japan where Nishikigoi were first produced although some have moved to other areas and a few were born outside these areas. The experts I will name all love or have loved Nishikigoi. Sadly there are some no longer with us. These people devoted their entire lives to the creatures that fascinated them and yet I know of none of these people where money was their reasons for doing so although realisation of this did play some part but only after the initial love had first been determined. Before I go on to mention names, I must first mention the Nishikigoi breeders of Japan and know of none who cannot easily select, as second nature, their tategoi produced from their own oyagoi. They do this year in and year out; to them it is as easy as falling off a log. There are many of these guys doing this as their sole source of income and their selection abilities are the real measure of achieving their best possible annual income. All these guys have their own very real expertise in reading Koi produced from their own parents and few can equal or better their abilities but there are a few who can that I know and have known and these are the real Koi experts. 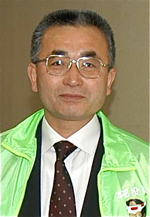 Hiroji Sakai was a Nishikigoi addict. In the years between 1979 and 1982, I believed he was a Yamakoshi person or a Koi collector from nearby. There was not a time I can recall when he was not visiting the breeder’s outlets in the area and I would bump into him on so many occasions we even bowed to each other after a while. He was always alone but, whilst I could pass by as a freak foreigner of no importance at all, this man was not, he was famous in the area. It was only when he handed me a card and said ‘Nishikigoi Nihon Ichi-ban’ and pointed to himself smiling, I discovered he was based in Hiroshima which may as well have been the other side of the world to me. I later learned that he was Yamamatsu’s biggest customer and had spent fortunes with him. I can still see him coming out of Dainichi holding a small bag with a 4” Kikusui inside and complaining he’d spent all morning selecting the Koi and had no idea if it was male or female. He said he’d had to pay 80,000yen for it (£133.00 then) and it was not even worth 10,000yen! That first visit to him at his farm opened my eyes as to the visions he had, he said his father had started the business some years before but he was determined to be the best breeder of Nishikigoi in the world. With each visit the farm expanded and more plans for further expansion were shown as were more parent Koi purchased from all parts of Japan. His base was the middle of nowhere and involved some hours to get there from the nearest cities; by the mid 1980’s he was producing just about every variety imaginable and one of his special customers was Micheo Maeda whom I saw on many visits. Toshio Sakai is another legend obsessed with Nishikigoi and always has been the eternal ‘Challenger’. His achievements go before him with the Koi he has produced and others he has found and purchased from other farms. Yes, he is the best Koi salesman in the world and yes, he does come up with a few terms that belong only to him but when he goes back to Yamakoshi for his regular visits, all his contemporaries feel his presence. There is an ‘aura’ about the man that has only been earned through results and a real vision that has been with him since his youth in Mushigame. Senichi Mano, the jovial one who comes over as the happy-go-lucky Koi dealer when, in truth, more world class Koi have passed through his farm than just about any other. He grew up with the best Koi in the world when his father acted as broker or agent for special Koi produced by outlying breeders far too difficult to reach with normal transport. It is said that this outlet was the one that kick-started Minoru Mano on the road to world recognition in Nishikigoi. Then there is Yoshiyuki Hirasawa with a stock of Nishikigoi that cannot be equalled in all of Niigata. He breeds every variety known apart from Showa but if you do see a Showa there, you can bet it’s really incredible and it has been selected and purchased by Yoshiyuki from another farm. There is more than one book that can be written just about this legendary man. That’s only four Koi Experts mentioned above, each is a Koi producer and each buys from other breeders – there are many others but the list would go on and on. However there is one loner who has fascinated me from the very day I first met the man back in 1979. The one who resembled a young Yakuza boss, the one who had the immaculately ‘permed’ hair, an assortment of sharp clothes and a wife who was then known to many simply as ‘Miss Ojiya’. 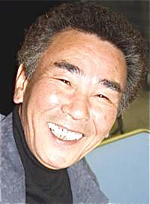 Seiji Hiroi is unique. Every Koi breeder in Japan knows this man who proudly shouts the praises of ‘Nishikigoi from Niigata’ at every opportunity. He is a Nishikigoi dealer who makes his own rules and sticks by them whatever changes go on around him. His customer base consists of the ‘Who’s Who of Nishikigoi’ over many decades and his outlet is only a mile from Ojiya station on the main road towards Uragara village (Koi Ginza). As to his ability in being able to supply world-class champion Nishikigoi, one only has to check his considerable Koi CV and then one can realise just why his business is named Kokugyokan which modestly translates as ‘House of Champions’. One thing you will not see when entering his main Koi house are ‘also-rans’ – he does not deal in these and never has done. You may well see some Koi that cause significant ‘scratching of the head’ but they are there for a reason. In earlier times, every Koi he had for sale had been located and purchased from other breeders. Since around 2000 he has experimented in using his only oyagoi which are Kohaku he breeds each June purely as a sideline. After endless culls of the fry throughout summer he may end up with a handful of large tosai that may still have some Murata blood in them again this is more for his own experience rather than an attempt to produce Kohaku that may be able to take on the world. There have been occasions, over the years, when Seiji has produced yet another No-Gyo-Sai Supreme that his dwelling house has been surrounded with cars from all parts of the area. These times are for ‘partying’ and the parties can last up to four days and nights – Seiji takes his celebrating as seriously as he does his trade. As mentioned, Seiji is a Koi dealer who buys stocks from any and every breeder who has Koi that may take his eye and, believe me, ‘eye’ is the important word to note. At the well known breeder’s outlets Seiji is almost part of the furniture today but back in the early 1980’s he was buying some Koi from breeders whose names had never been heard of even by these other famous outlets. Seiji can get to parts that damp cannot reach because it’s his job! Like many others in the area he has grown up surrounded by Nishikigoi as did his elder brother who trades less than a 20 minute walk from Seiji but there all similarities end. His elder brother owns the nearest Koi outlet to the entrance of Ojiya station, it is an all-singing and all-dancing affair at the important times of the year, with a large assortment of small but immaculate display ponds surrounded by landscaped rocks, lanterns, bonsai and flags to catch the eyes of the newcomers. He has made much money for as long as I can recall in supplying all kinds of Koi to the ‘less-discerning’ of Japanese Koi collectors. In the years from ’79 to ’99 just about all his stocks were purchased from the local auctions in huge quantities. Hiroi the elder specialises in quantity, I have never even considered buying even one Koi from here although I have walked around the place on many occasions. Hiroi the younger specialises in quality, I have bought many Koi from him over the years. On several occasions I have watched Seiji at work whilst being at the same breeder at the same time. I have purposely been looking, with one eye, in ponds with Koi of no interest to me whilst my other eye has been locked on to him. He always walks in alone and he always knows which pond he wishes to view. Once there, he finds his viewing spot and then squats on two knees, the cigarette follows and then silence. More often than not, he is there for five minutes or so and the next time you look he’s gone. I have yet to see him with a camera in his hand and would be surprised if the ones he owns ever leave his premises. All the information he needs is stored inside his head and is far better to him than the finest computer system could ever be. 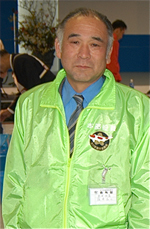 Seiji Hiroi is a Koi Expert. There are some times I truly believe that this man is the finest in the world, even at other times he is never out of my top three all time heroes. Seiji is not a dummy and nor are the breeders he buys his Koi from! He pays substantial prices for his tategoi and he grows them as he sees best for each one. Although he probably knows as much of the parentage of an acquisition equally as well as the breeder he has bought it from, this plays no part at all in his selection at all. It is the Koi before him he sets his sights on and only two things matter here. One is his eye and the other is his money. That’s it folks – his only tools of the trade. 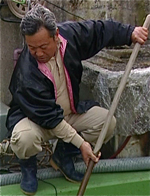 Seiji Hiroi is a Koi Expert. He does not write about them, he does not offer tips on ‘Koi Appreciation’ and he does not attempt to teach others about them because he has long-since recognised the futility of this. He grows his tategoi as he thinks fit – each one may need some special treatment and he is the one who makes the decisions. At the end of three, four or more later years in his care he wishes to produce a perfect example of a Koi and offer it for sale at a significant price indeed, he’s been doing this for many years and he is still doing this today. It is of no importance to him if a sansai Shiro Utsuri from Omosako’s best tateshita is available vs a number one sansai Shiro Utsuri from Kaneko’s better stocks has been seen or others from Seki or Nagashima are available at the same time. He is not concerned as to how they are classified and rated by the maker, he is only concerned as to how he can get the best profit from it in later years after he has first decided the Koi is worth a gamble. The term ‘Yorijo’ that can be seen after the names of most Koi farms denotes ‘fish breeder’. Many westerners believe this to be an outlet where fish are bred from parent stocks. Whilst this may well be true in most cases, the name means a person who grows fish – in this application it refers to Nishikigoi. Believe me, Seiji is a Nishikigoi breeder. For some time now, I have wondered is Seiji is also ‘see-er’ of the future. He has never owned his own parent stocks and I believe he has good reasons for doing this and nor has he ever had the problem of stocking and disposing with enormous amounts of tateshita produced by way of natural ‘wastage’ in order to get to the ones that have value. I am saying this because, purely due to exchange rates which do not seem to be getting any better in the near future, now there are other countries who can now produce general-grade Koi of a similar quality for less than one third of the price. True he pays significant money for his stocks but only after his expertise has weighed up every gamble beforehand. As to his success rate in doing all this? I have no idea at all but perhaps I could give my own estimations. Koi living up to his wildest dreams – 15%. Other Koi he makes fair to good profit from – 25%. Again, these are only my personal estimations and only one man knows the truth. I, myself can only try to give a ‘skimming of pointers’ regarding the subject of Koi appreciation and evaluation because the most I can give are ‘generalisations’ and ‘assumptions’ both are unwise. Does the reader own or understand what is required by a reasonably good system; the water parameters produced by that system; the depth of the system; the circulation in the system; the stocking rates; the maintenance regimes; the food and the feeding regimes; the annual seasonal temperature variations; the observance skills of the owner – should I continue? I do know that I have looked at Koi in Japan with pockets full of money in which to actually be able buy them, at the best times of the year, for a total period of time that is greater than any other individual I know of – Japanese or otherwise. However, I am not foolish enough to even consider writing detailed texts, pictures and examples of ‘what to look for when selecting Nishikigoi’. To dare to try and give pointers on ‘Koi Appreciation’ is way outside of my capabilities. I have tried by way of lectures and by texts and every time I have failed. It is a myth and nonsense to even consider that all Sanke, Kohaku or Showa produced by XXXXX breeders have equal ‘traits’ (love that term) when growing these to maturity. How can anyone in the world come out with the oft-quoted phrase heard everywhere today that this Koi or that Koi ‘Has a Lot to Do’ in their descriptions and opinions? Have they the ability to predict the future? Do they know the conditions that these Koi will be kept in? It is the Koi you are viewing before you that is the only important point to consider and it is almost irrelevant as to where it was produced or by whom it was produced. Once a non Go-Sanke has reached an age over 30 months in Japan there will be little changes apart from lustre, size and volume, this also applies to Gin Rin and Doitsu Go Sanke varieties. Once a Go-Sanke has reached an age over 40 moths there will be little pattern changes from there on in. In ALL patterned varieties, ‘pattern’ is of extreme importance – sorry to harp on. No genuine Koi Expert can possibly advise how one of his Koi will develop outside of his control. The unknown Koi breeder in the most inaccessible area of Japan has a real chance of producing a future All-Japan Champion. Not a great chance, but a chance nonetheless – Seiji Hiroi is well aware of this – it’s his job! There are books, still available today, written on the subjects of ‘Koi Appreciation’, ‘Development of Tategoi’ and other related subjects. There are articles also written covering these same subjects. There are lectures given also in many parts of the world covering these very same subjects. There are after-show resumes in bars around the world where these same subjects are discussed ad-infinitum. I am sure it is produced, in the main part, with the best intentions in mind. But who is writing and saying all of this and, more importantly, – is it accurate advice?